Student research, at both the undergraduate and graduate level, forms the cornerstone of our educational philosophy here in the Biology department. This page contains pictures of some of the labs used primarily for student and faculty research projects. While these labs are used mainly for research, there are also times when they are used by students for class work as well. This is a picture of Science Center room 216, the research lab shared by Drs. King Smith and Lee. 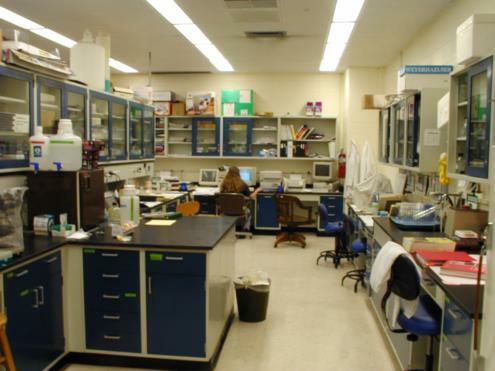 This lab was renovated as part of the $500,000 grant from the National Science Foundation to the Biology department in 1998. This is a picture of the microscopy image capture and analysis facility in room 206, the research lab shared by Drs. Tefft and Snetselaar. 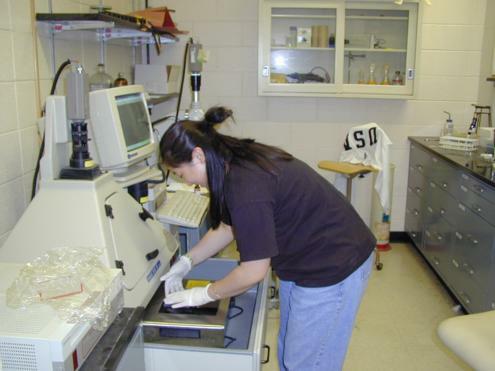 This lab was renovated in 1998 with funds from a grant from the National Science Foundation. From left to right are Justin Wells (‘01, working with Dr. Tefft), Paul Basciano (‘01) and Liz McNeil (‘02, both working with Dr. King Smith ). Paul and Liz are using an Olympus AX-70 research microscope connected to a PC-computer system to capture and analyze images of live retinal pigment epithelial cells. The microscope and computer were obtained as part of a Major Research Instrumentation grant to Drs. Snetselaar, Tefft, McCann and King Smith in 1997 from the National Science Foundation. Here, Ellen Cho (M.S. student working in Dr. Tudor’s lab) is using the gel archiving and analysis system located in Science Center room 107, a research lab shared by Drs. Tudor and McCann. This lab was renovated in 1993 using funds from a Ford Foundation grant.